Please join us and meet another group of amazing writers. Hugh’s Room Live is home to many a concert featuring Canada’s best singer/songwriters. Our new Songwriter Sessions Series explores songcraft in a round robin format, with artists peeling back the stories behind their work. Crossing genres and tapping into the natural Canadian gift of open, honest lyrics and tunes, we’ve invited some of our favourites to delve deeper and share their songs with you. David Leask - Originally from Jedburgh, Scotland, David is a powerful performing songwriter, who has built an artistic bridge between the influences of his birthplace and the fresh possibilities of his adopted Canadian home to produce five critically-acclaimed CD’s and numerous international songwriting awards in different genres. Songwriters Magazine called David, “the most consistent Canadian songwriting competition winner.” He was also awarded the Mississauga Established Performing Artist of the Year. David’s sixth and latest recording, “Six in 6/8” has just been released. A seasoned and commanding performer, having played nearly 2500 gigs in the last 20 years, David’s music draws from Celtic roots, Americana and country, topped up with a pop sensibility that brings to mind the talents of Van Morrison, Jack Johnson and Foy Vance. Andrea Ramolo - Andrea, one half of acclaimed Canadian folk-pop duo Scarlett Jane, has a new solo album, NUDA (Italian for naked). The album emerged out of a deep depression following a romantic breakup and a shift in her artistic path; but brought about a hugely positive metamorphosis, personally and creatively. Cool, dark, understated and melancholy, the alternative-folk album produced by Michael Timmins — a man who knows about melancholy and understated in his own band Cowboy Junkies — has a companion version of the same songs without a full band. Stripped down to its barest form, Da Sola (meaning by myself), was produced by her pal Faye Blais and features Andrea singing and playing either baritone or acoustic guitar. Tony Quarrington - Veteran musician, Quarrington, has been a formidable and thriving presence on the Toronto music scene for more than 40 years. He first appeared at the Mariposa Folk Festival in 1966, and played at many renowned Yorkville nightclubs and coffee houses in the late ‘60s, performing ballads, blues and his own original tunes. Melanie Peterson - Blessed with an ability to imbue her vocals with palpable emotion without going over the top, Melanie, a Saskatoon born, Toronto based, singer-songwriter and actress has boldly become one of the brightest lights on the Toronto music scene. Melanie has been referred to as “Mary Poppins with a broken heart” by BBC Radio and has been recognized as having “a beautiful voice” and being a “terrific songwriter” by Joe Warmington of the Toronto Sun. 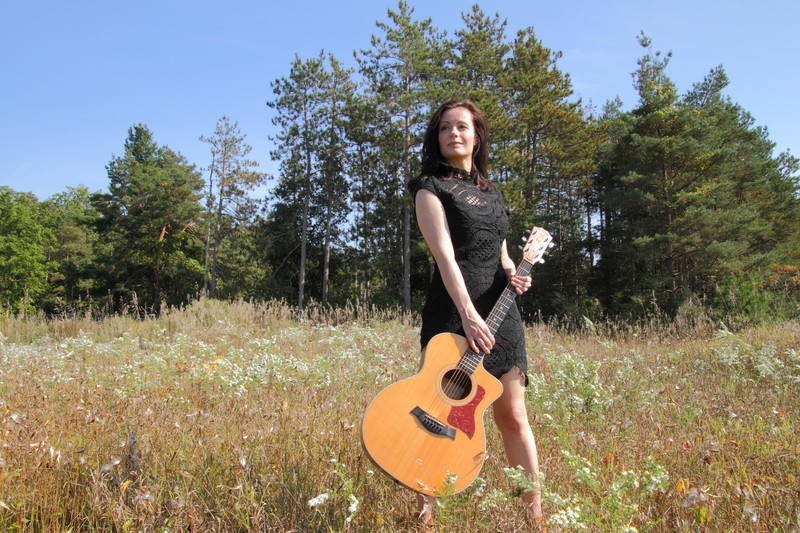 She earned a spot within the independent music scene in Toronto March 2012, when she showcased her original music during Canadian Music Week, at the Royal York Library Bar. She was invited back to perform two showcases at CMW 2013. She launched her first full-length album ‘Unbreakable’ in April 2013 at The Piston in Toronto. Melanie followed that up with a triumphant NXNE showcase and a successful southern Ontario tour.In November 2016, Melanie received a FACTOR artist development grant, which she used to record and promote an original holiday single titled “Santa’s Sleigh”. The single was produced by award winning producer Chris Birkett (Sinead O’Connor and Buffy St. Marie), and was released to radio stations across Canada in December 2016. In early 2017, renowned SKA artist Susan Cadogan recorded a cover of Melanie’s folk song “Truth Talking” and released it as a single. “The legendary Susan Cadogan sings a rootsy rocksteady love song in her unmistakable voice, with a sweet lyric by Melanie Peterson that could have been written a thousand years ago or last week.” SKA’D For LIFE,ska4u.com. A year ago Melanie released a two-song EP appropriately titled ‘Two’ produced by Mitch Girio.